Freezing sperm is an option for men who are not yet ready or able to have a child but who want to give themselves the option of doing so in the future. One of the primary reasons many men freeze their sperm is if they develop a condition which puts their ability to father children at risk. Cancer treatments, for instance, can lead to infertility in men. Rather than not ever have children, a man may choose to freeze his sperm until he was ready to do so. If a man loses his battle against cancer, his wife or significant other, has the option of using his sperm to have children in the future. Unfortunately, life happens. Bad things occur when we least expect them. Being diagnosed with cancer is one of the most frightening and heartbreaking things a person can experience. Men that are diagnosed with cancer may never be able to impregnate their spouse or girlfriend after undergoing radiation and chemotherapy treatments. Rather than a man simply accepting this fate and resigning himself to the fact that he will never have kids, he can be proactive and freeze his sperm while it is still healthy. As mentioned above, when this sperm is ready to use, he can have it unfrozen and use it to fertilize his significant other’s egg(s). Men may also want to freeze their sperm if they work in an industry where they are constantly exposed to materials or chemicals which may make it difficult for them to reproduce (reproductive toxins). Certain medications may also sacrifice the quality of a man’s sperm. Freezing and banking his sperm before starting this type of medication regimen is one way to ensure that he has viable sperm available to him when he needs it. Some diseases and conditions make it difficult for a men to ejaculate, for instance, paralysis, diabetes and multiple sclerosis, freezing sperm and then using it to impregnate ones’ spouse make it possible for a man to still procreate. The process of freezing sperm is pretty easy. After undergoing a physical, a man will be asked to provide a specimen at the lab or at home. Most men will bank at least three ejaculates. The sperm is then frozen. 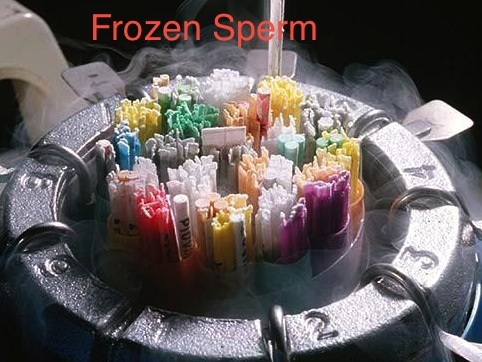 Sperm can be frozen for many years. However, banking it more than 12 years is not typically advised. Studies have shown that after this amount of the time, the sperm’s quality begins to deteriorate.